Grab this knitting kit that includes the pattern for the Ashbury Mitts by Simona Merchant-Dest and two skeins of Lhasa Wilderness yarn in natural cream, as seen in Interweave Knits Holiday Gifts! A perfect gift! Grab this exclusive Kit in the Knitting Daily Shop for a last-minute knitted gift. A great pair of mitts for all ages (or, a great knitting kit for the knitter's holiday wish list! ), the Ashbury Mitts made with luxe yarn are available while supplies last. as seen in Interweave Knits Holiday Gifts. These fingerless mitts designed by Simona Merchant-Dest first appeared on the cover of the Interweave Knits Holiday Gifts 2011 special issue. A relatively quick knitted accessory to make, these make the perfect gift for all ages. Or, treat yourself! A classic design with heart-shaped knitted lace studded with miniature bobbles, the Ashbury Mitts are knit from the top down in a luxurious yak and bamboo yarn. Finished with a ribbed hem, these mitts are easy to knit and a treat to wear. 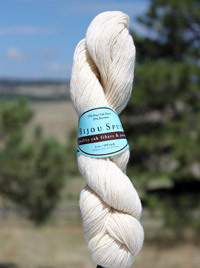 From Bijou Basin Ranch comes a yak and bamboo blended yarn that is shimmery and luxurious to knit with and wear. Soft and lightweight yak fiber is blended to perfection with breathable bamboo fibers which are also naturally anti-bacterial. This yarn has it all: softness and strength, plus an excellent hand and drape, all in a versatile sport weight! Each skein of Lhasa Wilderness yarn contains 180 yards of yarn. Two skeins of this yarn is enough to make the Ashbury Mitts in up to a 8.25 inch hand circumference and 12 inches in length. Hurry! This exclusive Kit is only available while supplies last. Order yours today for a great holiday gift to knit or give. Or! Knit these mitts for yourself and add these classic knitted accessories to your own collection. The information/description of the kit clearly says that it includes a PDF of the pattern. A close look at the description tells the buyer that the kit includes "one PDF download of the Asbury Mitts pattern." In this case, "includes" means that the buyer doesn't need to pay extra for the pattern.